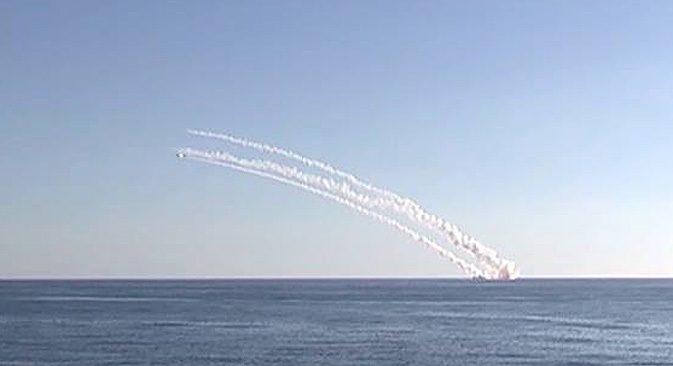 A multiple launch of Kalibr seaborne cruise missiles from the submerged Rostov-on-Don submarine. The intensity of strikes on sites belonging to ISIS and other extremist groups in Syria was boosted on Dec. 5 in line with a decision of the Russian Armed Forces supreme commander-in-chief, the Russian Defense Ministry press service and information department said on Dec. 9. "Russia's Tupolev Tu-22M3 strategic bombers stationed at the Mozdok airfield, the aviation group's aircraft stationed at the Hmeimim airfield and a submarine deployed in the Mediterranean Sea have delivered a massive missile and air strike on the sites of ISIL and other extremist organizations in the territory of the Syrian Arab Republic," the report said. A multiple launch of Kalibr seaborne cruise missiles from the submerged Rostov-on-Don submarine has been performed for the first time ever, the ministry said. "Two important command posts of the terrorist organization ISIL in the al-Raqqah province were destroyed as a result," it said. Tupolev Tu-22M3 strategic bombers have performed 60 combat missions from the Mozdok airfield to attack 30 terrorist sites in the al-Raqqah and Deir ez-Zor provinces. "Operative-tactical and army aircraft stationed at the Hmeimim airfield have performed 238 combat missions and destroyed 699 hostile targets. Sukhoi Su-3o aircraft provided air support to the massive missile and air attack. All aircraft returned to base after the mission had been accomplished," the department said. According to it, 1,920 bombs of various types were dropped within four days. "Seventy command posts, 21 militant training camps, six ammo and explosives factories, 43 arms and hardware depots, six oil storage and refining facilities, and other sites were destroyed," the report said. The strikes created conditions for further offensive of the Syrian army interacting with other armed units in the areas of Aleppo, Idlib, highland Latakia and Palmyra, the report said.